I was drawn to this book by its premise of a twenty-something English girl moving to Greece to be with a Greek man that she’d met on holiday there. I’ve known women who have done just this, only for their dreams to end in divorce, because they were unable to cope with the culture clash, particularly the dominance of their husband’s mother – a problem that dogs the heroine of this story, Sophie, unlike the distant relationship with her own mother. I was very interested to see how Sophie fared. I don’t want to give any plot spoilers, but suffice to say that this is a rewarding and satisfying read, written with great care and thought by someone who clearly knows intimately each of the settings that she describes. At the outset of the novel, Sophie is working as a chef, despite having trained as an illustrator. Her true artistic talent is echoed by the author’s clear visualisation of the settings. Kate Frost is very good at creating a sense of place, and she makes it very clear why Sophie loves the different settings. Indeed, the settings almost feel like characters in themselves. It was an unexpected bonus for me that Cephalonia, where I first fell in love with Greece (but not a Greek – I was there with a Scotsman! ), is also where Sophie falls for Alekos. I hope it isn’t giving too much away by saying this is a life-affirming and uplifting read about families, marriage, motherhood and relationships, though it worked out in a different way from my expectations. 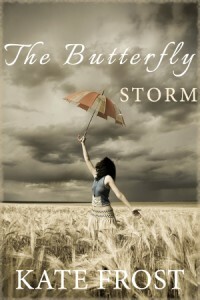 The Butterfly Storm of the title presumably refers to the theory that the flap of a butterfly’s wings in one part of the world can cause a chain reaction that magnifies into a storm in another part of the world. By the end of the book, the appropriateness of the title is clear:small decisions made at one point in a person’s life can cause a tsunami later on. I also loved the way that butterflies and occasionally moths are also woven into the story throughout, popping up here and there naturally, like an artist’s signature or motif, though without the obviousness of the “Find the duck on every page” in Stephen Cartwright’s children’s books (though I love those too!) To me these creatures served as a wonderful metaphor for the fragility and brevity of life, therefore making the characters’ choices all the more important and adding to the sense of urgency that if they don’t make the right decisions, they risk losing their happiness for ever. Any book that makes me stay up later than I intended because I am desperate to know what happens next automatically gets five stars from me. This book even had me staying awake early morning, when I inadvertently woke up half an hour before the alarm, in order to finish it. In my permanently sleep-deprived state, this is a rare occurrence! I look forward to reading more of Kate Frost’s work. Find out more about Kate Frost and her other books at her website, www.kate-frost.co.uk.blog/. Sounds a good book – so another on my To Read List!